In our last post, we saw how you can limit your deliveries for a date in Order Delivery Date for WooCommerce plugin. Same way you can limit the number of deliveries for a specified time slot. For example, you have online supermarket shop where you have set three time slots for each day and you can deliver only 15 orders per time slots. And after 15 orders the time slot for that particular date should be disabled for further deliveries. So you can set this up in the plugin. 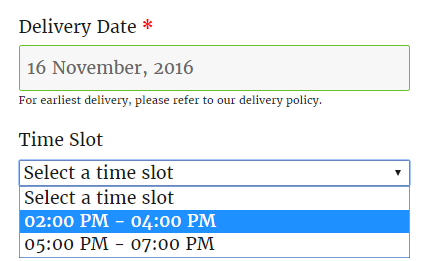 You can find the setting for limiting the orders per time slot under Order Delivery Date -> General Settings -> Time Slot. If you have online Chinese restaurants where you can deliver only 15 food course orders for a time slot. So you can set Maximum Order Deliveries per time slot (based on per order) option to 15 while adding the time slots. You can also set a different number of delivery for different time slots. For example, between 11.00 AM to 1.00 PM on Wednesday you can deliver 15 orders, but for 2.00 PM to 4.00 PM time slot, you can deliver 20 orders. So, while adding time slots you can set the value as per the time slot availability. After adding the Maximum Order Deliveries per time slot (based on per order), you can see them under the Time Slots list table shown below. Once the orders are placed for a preferred time slot, the time slot will be disabled on the checkout page for further deliveries. For example, on Wednesday at 11.00 AM to 1.00 PM, 15 orders are already placed and the Maximum Order Deliveries per time slot (based on per order) is also set to 15, then the time slot 11.00 AM to 1.00 PM on Wednesday will be disabled in the time slot field. In the above example, we saw how you can limit your deliveries per time slot using Maximum Order Deliveries per time slot (based on per order) option from the plugin. The feature is useful for the businesses who can deliver only maximum deliveries per time slot. We will be discussing how you can limit your deliveries based on the selected quantities of the products in our next post.